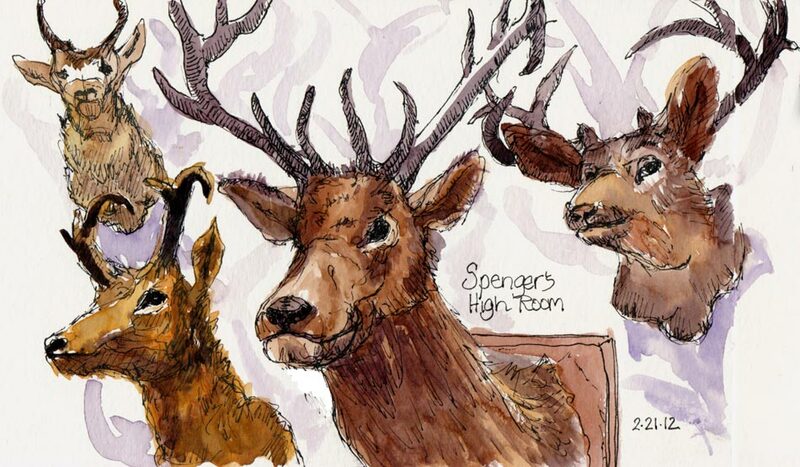 The High Room Taxidermy at Spengers, ink & watercolor, 5x7.5"
Our Urban Sketchers group met Tuesday night at the historic, oldest restaurant in Berkeley, Spenger’s Fish Grotto. I called ahead to see if we could sketch in the room whose walls are covered with taxidermy animals and fish. The manager was very supportive of our visit, even though he was dealing with half the restaurant (which has many rooms, all full of seafaring and other historic artifacts) being closed for carpet cleaning that day. I arrived a bit late due to continuing construction work at my house, and found the group sitting at a big table in the middle of the taxidermy room (actually called the “High Room” because of the super high ceilings). Richard the manager had opened and designated the room just for us. Thank you Richard! We are delighted that Berlin Urban Sketcher and illustrator Olga Prudnikova has joined us for the next couple of months while she is in Berkeley. She and the rest of our group managed to do many sketches to my one. You can see their beautiful and quirky sketches on our SF Urban Sketchers blog here and here. Thank you Spenger’s general manager Richard, for your support and hospitality. We had a great time sketching and snacking on their famous creamy, thick clam chowder. impressive sketches of the taxidermy! if you have a moment would you mind sharing with me what supplies you would normally carry to a group sketch or even a solo sketch. I’ve been curious! It wouldn’t be my idea of a sketch subject but you have done a lovely job. Great sketches, including shadows! Does this count toward the practice you were doing of heads and faces?! what a fascinating subject! they all seem to have approving looks on their faces too! full of personality!